Not only sports athletes suffer from Musculoskeletal disorders (MSKD) – disorders of the muscles, tendons, ligaments, nerves, discs, blood vessels, etc. 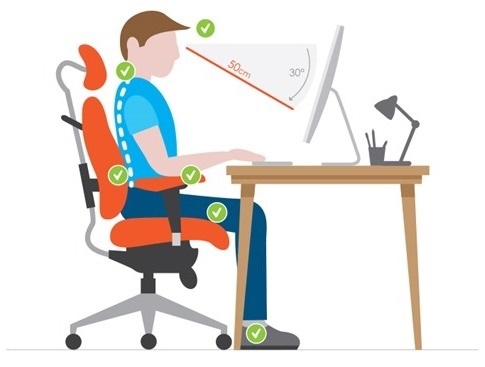 If you are an office worker, you are prone to develop MSKD in the upper extremity and neck area, particularly if your workstation has bad ergonomics. Carpal Tunnel Syndrome is also common and painful. Did you know that Osteopathic Manipulative Medicine can both prevent and treat pain resulting from poor working conditions? Do you spend endless hours in front of a monitor? Do you experience aches and pains all over your body? In scientific literature, we can highlight a variety of studies that investigate work-related Musculoskeletal disorders (MSDs) in the upper extremity and neck, and possible intervention to prevent and manage their development. MSDs are broadly defined as a condition that affects different areas of the body, such as joints, bones, ligaments, tendons, muscles, cartilage and supportive structure. These risk factors have been found to be associated with past history and work environment. The most frequent injuries associated with these risk factors are muscle strains, low back injuries, and tendinitis. Among the specific type of injuries, carpal tunnel syndrome, epicondylitis, and rotator cuff injuries are the most frequently diagnosed. Schneider et al. (2010) reported that the most common health problems observed in office workers are muscular pains (affecting 22.8% of the respondents and defined as neck, upper/lower limbs and/or shoulders pain), backache, general stress, and fatigue. Furthermore, 35.4% of the participants believed that their health is greatly impacted by their working environment. Moreover, among desk-based workers, exposure to these risk factors has been found to be higher among the young professional population due to prolonged periods of sitting and standing. In the UK, it is estimated that more than half a million workers suffer from MSDs (Health and Safety Organization, 2017). Additionally, it is important to take into consideration that work-related MSDs have a broad economic impact not simply on non-related work activities but even more on society. Office workers who experience musculoskeletal symptoms in the upper extremity and neck region have been shown to be less productive and more prone to develop additional MSDs (Van den Heuvel et al., 2007). The cost of work-related MSDs, especially upper limb musculoskeletal disorders have been estimated to reach 2% of the EU Gross National Product (GNP) (EU-OSHA, 2010). Therefore, MSDs not only impact workers but also have an economic impact on the enterprise (Schneider et al., 2010). Studies addressing the association between risk factors of MSDs and computer users stress the need to reduce the amount of time spent at the desk and the relevance of workstation ergonomics in order to decrease musculoskeletal symptoms (Fogleman and Lewis, 2002). Additionally, more in-depth studies focusing on ergonomics confirmed that prolonged awkward body posture combined with the use of a portable computer or flat panel displays, can cause musculoskeletal discomforts (Malińska & Bugajska, 2010). An analysis conducted by Gerr et al. (2004), found a positive association between musculoskeletal symptoms in the arm and hand and time spent on keyboard use. Furthermore, an additional analysis piloted by Ijmker et al. (2006) found moderate evidence for a positive correlation between the arm and hand musculoskeletal symptoms and hours of mouse use. Office-based computer users develop MSDs due to multiple reasons. Conventional keyboards and mouse use require the computer operator to fully pronate their forearms. This forearm posture may increase tissue pressure and increase the load on the forearm muscles, leading to wrist and forearm disorders. A prospective study conducted by Aaras et al. (2002) noticed a reduction in the discomfort of hand, wrist, forearm and neck region when evaluating an alternative mouse which allows the forearm to be in a more natural position. Computer work forces users to maintain stationary postures for extensive periods of time, while looking at a monitor and performing precise and repetitive tasks with the entire upper extremity. This means short and static muscle contractions leading to constant overloading of muscles, leaving no time for appropriate recovery periods. This will lead to circulatory and metabolic alterations in the musculoskeletal structures of upper extremity and neck of office-based computer users presenting as pain and discomfort. Repetitive computer work is frequently mentioned in the literature for being one of the main risk factors for the development of MSDs in the neck (Malińska & Bugajska, 2010). Elevated lactate levels and impaired oxygenation were observed within painful muscles among women suffering from chronic neck pain, who performed repetitive tasks (Sjoaard et al., 2010). Furthermore, studies investigating muscle activity, during computer use, have shown increased muscle activation and a reduction in resting periods among computer users (Dennerlein et al., 2006). Crenshaw et al. (2006) have investigated the effectiveness of passive and active breaks during working hours among office-based computer users, focusing his attention on muscle oxygenation. Results reported an increase in oxygenation and blood volume in muscle during the active breaks. However, although clinical evidence is limited in this field, in order to decrease MSDs due to prolonged computer use, exercise reminder software programs have been created (Van Den Heuvel et al., 2003). In the literature, the effectiveness of these programs is supported by several studies (Barredo et al., 2007) and by the American Occupational Therapy Association (AOTA, 2017). In conclusion, the strong methodological evidence in scientific literature supports the use of a forearm support and worksite physical activity (strengthening and stretching exercises) as effective in preventing MSDs development and decrease pain levels in the upper extremity and neck region of office-based computer users. Osteopathy can exercise a central role in the prevention and management of these musculoskeletal conditions. If you would like to know more about how Osteopathy can support your life on a daily basis and help repair musculoskeletal disorders, get in touch with Guglielmo Cenci, Osteopath at Dr. Susan Jamieson Integrative Medical Practice in Hong Kong Central. He can also advise on office ergonomics.